I knew it was due to happen someday. My old faithful Black and Decker toaster oven finally went to toaster oven heaven. Of course, it happened at the worst possible time – dinner guests were coming and my regular oven was already full with various casseroles and side dishes. I needed my toaster oven / broiler to cook my main dish – lasagna. With some major readjustments and a lot of appetizers, dinner was finally served. However, I needed to replace old faithful quickly. 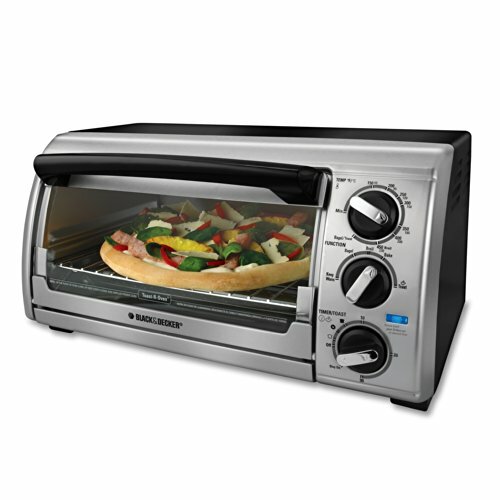 I relied heavily on this supplemental cooking appliance and frequently used it instead of my oven. Macy’s was having a terrific sale so I headed over to see what they had. Miraculously, I saw a huge display of Black and Decker toaster ovens. As I brought it to the cashier I asked if she knew for certain if this would handle 13 x 9 baking dishes; there was nothing on the box to answer my question. She assured me it would handle these pans. I unpacked it as soon as I got home. Of course, my cats really believe that any trip to the store that results in huge bags or interesting boxes is solely for their entertainment and enjoyment, so as soon as the empty box was put on the floor, it was quickly turned into a kitty play pen. After seeing what they were doing, I prayed this thing was going to solve my problems. And I was grossly disappointed. One quick glance showed me immediately that this not only couldn’t handle large pans, it looked like it could barely handle four pieces of toast, and I was quickly proved right. It comes with what they call an adjustable rack. However, in reality, you can’t move it to any other position but one because if you choose to put it on a lower rung in order to handle perhaps a chicken breast, you can’t close the door! The door has these odd looking half moon thingies that apparently help close it securely, but they hit the rack when it’s on the lower level, making it impossible to close. The first thing I tried to make was two bagels. My husband loves sandwiches on bagels, and this was the perfect chance to start putting this through its paces. I set the dials correctly and waited. And waited. There is even a special setting for bagels, so I figured it could handle the job quickly and well, but I was wrong. The bagel in the back was almost burned, and one in front was barely warm. That evening my husband asked for brownies. I normally would have baked them in my other toaster oven, but this one is so small I couldn’t fit even my brownie pan. The following morning I tried making toast. After all, a toaster oven should at least be able to make toast, right? Wrong again. I put in four slices of regular bread and set the toast for medium. I had to reset it twice because the toast just wasn’t toasting. When it was finally brown, I saw that the two back slices were much darker than two front slices and all four slices had turned into something similar to Melba Toast – they were crunchy all the way through! The two front pieces were not only crunchy, but they barely browned at all, and they were barely warm. Oddly enough, this comes with a Broiler. I’m not sure what they expect you to make in the broiler since when you put the rack at the only level it fits on, there isn’t enough room for a burger or a steak without it getting burned. And if steak is your goal, it had better be a mini-fillet mignon because you need to use the tiny pan that comes with the oven. The instruction booklet actually comes with recipes that are supposed to serve four people. The recipes look quite tasty, but I honestly can’t figure out how they expect you to put all that food into the oven to cook it! One particular recipe calls for pork chops with a sauce, a sauce which will most assuredly boil and spill over when you use the shallow pan that comes with the oven. All in all, this was a big disappointment since I have always been a great fan of Black and Decker appliances, and I have others in my kitchen that I just love.